Lars Iyer’s Spurious was one of the surprise critical successes of 2011, shortlisted for the Guardian’s Not the Booker Prize and named novel of the year by 3 a.m. Magazine. I say it was a surprise because there were a couple factors that might have predicted things going otherwise: the style and some of the content was lifted directly from Iyer’s blog (so why bother to write the novel? ), there is no discernible narrative (so again, why write the novel? ), the cruel humor that propels the book forward has the potential to alienate readers not attuned to a very specific strain in the British comedic sensibility (so why distribute the novel outside the UK?) and finally the liberal use of “continental” philosophers (Maurice Blanchot, Franz Rosenzweig) and artists (Béla Tarr, Franz Kafka) can give rise to the suspicion that pretension is masking the fact that the book is lacking in substance. But in a more important sense, the success of Spurious was not surprising at all, due primarily to the sheer inventiveness of Iyer’s writing. This fact is on display once again in Dogma, the second in what will eventually be a trilogy of books following W. and Lars, two British academics with a healthy sense of their own failings. In Dogma three principle failures serve to structure the book: in the beginning, a lecture tour in the American south (“What need was there to come to America?, W. asks. He’s learnt nothing here. His thought hasn’t advanced. Not one new idea!…The United States of Thought-Robbery, that’s what they should call it, W. says. The United States of Vastation and Waste…”), in the middle, the founding of “Dogma,” a loose and ever-adaptable intellectual movement that embraces pathos, sincerity, plagiarism, and drunkenness (“Our twelfth Dogma presentation…what can we recall of that? What really happened? W.’s unsure; I’m unsure. Was there shouting? Were we forcibly ejected from the auditorium? Was there a diplomatic incident? Did I expose myself? Did W.? Did I expose him?”), and at the end, the confirmation of W.’s suspicions that he is going to be fired from his university job (“It’s come. It’s finally happened. He’s being made redundant. They’re running him out of the college on a rail, W. says. Even I, with my Hindu fatalism, couldn’t have predicted this.”). Within this loose framework, Iyer is able to accomplish quite a bit. In some ways, the book does for the novel what modal jazz did for soloists: uncouple your improvisations from a rigid structure, radically simplify your range, and you’ll be shocked to hear how good this new freedom sounds. 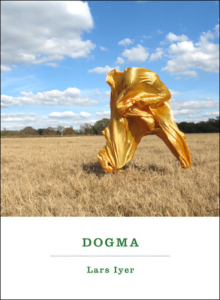 In Dogma, W. exhibits his two principle interests, both of which he pursues with a level of energy that, were there not a sub-current of preposterousness shot through the novel, we might even find admirable. The first, according to W., goes under the general heading “capitalism and religion.” “The ‘and’ is designed to be provocative,” W. is quick to add; but it is also designed to permit entry to whatever artistic or intellectual strand a professor of philosophy and literature wants to take up. Paul Celan’s cryptic fragment about seeing God under the door of his hotel room, Herzog’s dancing chicken at the end of Strostzek, Hermann Cohen’s Logic of Pure Knowledge, W. and Lars’ re-enactment of Freud’s “primal scene” on the dance floor in front of their bemused Polish hosts – it all portends the end times. W.’s second interest develops what was the principle appeal and greatest display of Iyer’s creativity in Spurious – the incessant prodding and belittling of his best friend Lars. In Dogma, W.’s comments on everything from Lars’ gait (“I know nothing of the art of the stroll, W. has always said. I know nothing of the pleasure of the flâneur”), to the infestation of rats in Lars’ apartment (“I have a kind of awe for the rats, he can tell, W. says. They impress me. I approve of them. They seem to be on my side…I can only have murine thoughts), to the metaphysical implication of Lars himself, who is at once a millstone, a curse, and W.’s necessary companion.